Are there foods that you could not stand as a child that you’re now realizing aren’t so bad after all? Meat loaf is one of those foods for me. It recently occurred to me…what’s my hangup? I love burgers and meatballs. Isn’t meat loaf basically the same kind of thing only sliced? I decided it was time to move past this silly twenty-year aversion. Let me say that this recipe, from the back of a box of bread crumbs, is a good one. However, I did not follow the recipe – really kicking myself for that! I deviated from the recipe in two apparently critical areas. First: I added an egg. It made me nervous that the recipe didn’t call for any eggs while every other meat loaf recipe I’ve seen calls for at least one or two. I should have had more faith. Between the milk and grated zucchini in the recipe there was plenty of moisture. If you ever wondered whether it was possible for meat loaf to be too moist – yes, it can. My second error was in pan size. I need to locate a ruler but I think my loaf pan is an inch wider than the 9x5x3-inch pan the recipe calls for. So it ended up being a shallower loaf than I expected, with my slices ending up more like strips (maybe Lady Gaga could make bracelets out of it – lol!). This actually wasn’t such a bad thing as I was planning to turn the leftovers into Meat Loaf Patty Melt Panini – strips fit better on the bread anyway. Here’s the good news: I like meat loaf now! Unusual size and extra egg notwithstanding, it had great flavor. Especially with the marinara it reminded me a lot of spaghetti and meatballs (without the spaghetti). Next time – and there will be a next time – I’ll actually follow the recipe and enjoy it even more. Mix all ingredients but marinara sauce and press into a greased 9x5x3-inch baking pan. Top with marinara sauce. Bake at 350°F for 55 minutes or until cooked through. I love meatloaf, but my husband doesn’t. I need to share your thoughts about meatballs with him to see if I can change his mind! Anyway, I’m going to have to try this recipe. I’ve never seen zucchini in meatloaf, but what a great way to sneak some veggies into my 6-year-old’s meal. That’s actually a really good thought, Anne – there’s a whole zucchini in there and kids probably won’t even be able to taste it. Oh, meatloaf was and still is a classic. Love, love, love it. Especially as meatloaf sandwiches. Definitely looking forward to your panini! I recently fell back in love with meatloaf when I used leftovers as part of a marinara meatloaf sandwich. Yum. 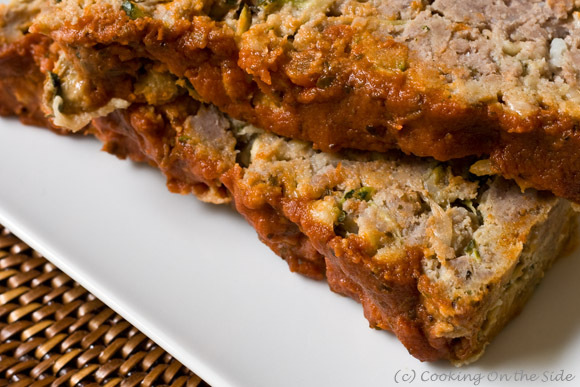 This is actually my favorite meatloaf recipe but I didn’t have the bread crumbs can. So glad to find it on your site. Thank you! Previous post: Congrats to Our Sangria Tea Winner!